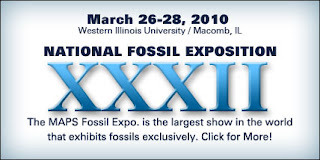 The Mid-America Paleontology Society (MAPS) fossil expo is coming up March 26-28, 2010. This society is one of the few who focus just on fossils. Click on the logo above to visit their very nice website. I like their color scheme and images. It looks like a great expo to attend if you can!